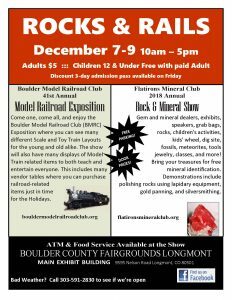 Rocks & Rails, the clubâ€™s annual Gem and Mineral Show is on December 7-9 in 2018 at the Boulder County Fairgrounds in Longmont, 10 AM â€“ 5 PM each day. Adult admission is $5, children 12 and under are free with a paid adult. Our show is in conjunction with the Boulder Model Railroad Club, so you can enjoy lots of rocks, minerals, and fossils, plus model trains in the other half of the building. The show features gem and mineral dealers, exhibits, speakers, classes, grab bags, and childrenâ€™s activities such as mineral identification games, a dig site, rock and mineral polishing, and more. Bring your own finds and treasures for free mineral identification.